For Gen 2 Sub 2000, will not fit Gen 1 Sub 2000. 2. Remove front sight per Kel-Tec's instructions. 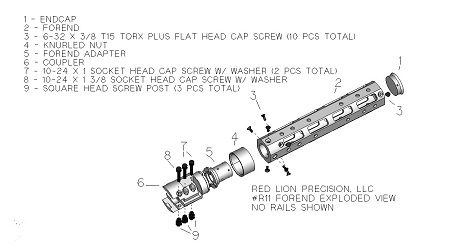 4.Configure R11 forend (part #2 in exploded view diagram) with rails at whatever location you desire. Forend does not have any predetermined top or bottom as all sides are indentical. To attach rails place grommet into locating hole from the inside of the forend (hold in place with finger or popsicle stick or alike if your finger can't reach). Place rail into position. Place 10-24 x 1/2" flathead screw through the rail and into the grommet and tighten till grommet is slightly flexed and somewhat conformed to the forend ID radius. Changes made since first run include new slot cutouts for more rail options (basically any rail that is 19 slot or under and uses 10-24 screws in bolt hole patterns divisible by .394) and cooling slots machined to accept Ergo LowPro Rail Covers when a rail is not present in that location. Cut rail covers into four rib sections for use. Magpul polymer rails can be used along with their supplied hardware except in the most forward location or rearward location in which case using one of our rail grommets would solve this but rail will protrude slightly out the front. Ours and the Magpul rails will co-witness with either the factory sights or our R7 front sight when using a mount that co-witnesses with AR15 iron sights when mounted on a AR15 A3 flattop reciever that has a 1/2 inch riser. 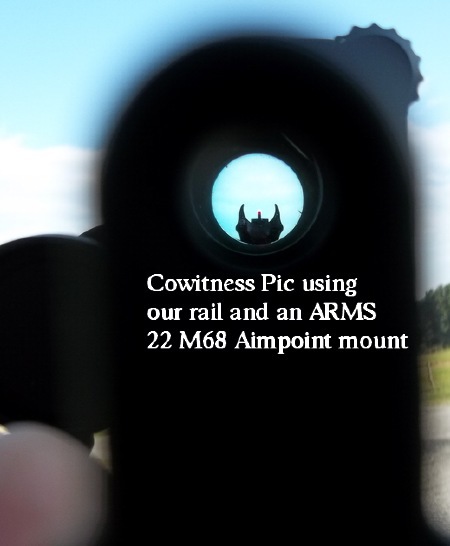 In our example pic mount used was the ARMS22 M68 Aimpoint mount without spacer. 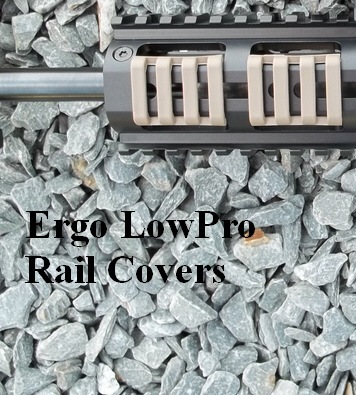 Below are pics showing Ergo Lowpro rail covers and a pic of the cowitnessing. Gun Interface-Forend coupler clamps to barrel and also engages back plate on S2K for positioning. Awesomely machined piece of equipment however not machined precisely to accept standard M-Lok accessories. It looks like a standard M-loK capable accesory but it is NOT. The slots are machined too small to accept standard M-Lok components. It will only accept Flat Bottom accessories and as well you will have to use special Red Lion nuts (they did send me some of them once I discovered all of this) and in many cases screws for them. Also, the swivel action mechanic comes loose after firing a few rounds. This forend is outstanding. It changes the whole feel of the rifle in a good way. No longer does my Sub2k feel like a cheap toy. Solid lockup and still folds down easy. The instal was fairly straight forward, but I would recommend taking a look at the Fire Mountain instal video on Youtube.